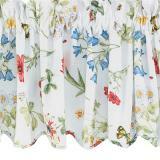 This Ellis LaSelva Duchess Filler Valance has a large scale tropical print. 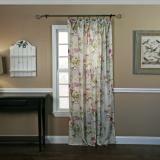 This Ellis Regency Duchess Valance has a medium scale jacobean floral on an colored background. This Ellis Regency Duchess Filler Valance has a medium scale jacobean floral on a colored background. 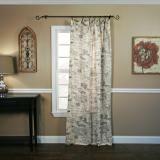 This Ellis Riviera Duchess Valance has a large scale leaf and vine pattern. *Picture shows what the color looks like. Detailed image shows the Duchess. 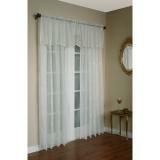 This Ellis Riviera Duchess Filler Valance has a large scale leaf and vine pattern. This Panel has black writing on a natural background. 100% Polyester Crushed Taffeta. Dry clean only. Sold per panel. 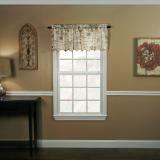 This Valance has black writing on a natural background. 100% Polyester Crushed Taffeta. Dry clean only. Park Designs Wildflower has colorful flowers, bumble bees and butterflies on top of a white background. *First picture shows what the pattern looks like. 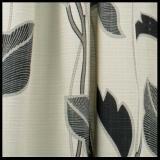 Second image shows the style of curtain.